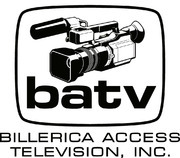 Referred to as Billerica’s First Amendment Forum, electronic soapbox and clearing house of information, BATV was incorporated in 1987. Our goal is to encourage and enable open extensive communication through BATV while promoting diversity and responsibility. Billerica Board of Selectmen meeting. A mockumentary of a pub crawl with Santas. Billerica Memorial High School Building Committee meeting.